The sculpture in front of you is called The Call and The Challenge. 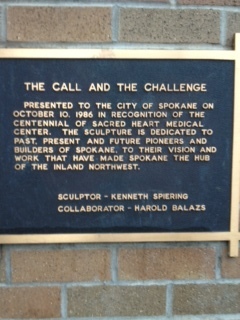 It was erected by Ken Spiering in 1986 to commemorate Sacred Heart Medical Center's 100th year anniversary. 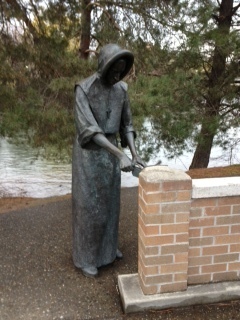 The piece depicts Mother Joseph, a Sister of Providence, laying bricks. The artist, Ken Spiering, was born in Wyoming in 1950 and now resides in eastern Washington. Mr. Spiering's, a graduate from Gonzaga University, has a diverse amount of artistic talents including watercolor and oil painting, carved wood, cast bronze, and sculpting concrete and steel sculptures. 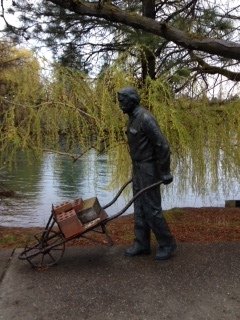 His work can be seen all over the Northwest including the giant red wagon located in Spokane's Riverfront Park. So who was Mother Joseph? 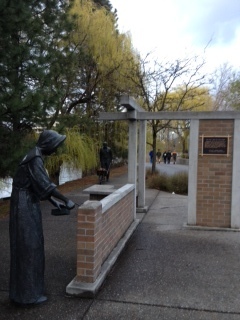 Mother Joseph joined the convent of the Sisters of Charity of Providence (now Sisters of Providence). In 1856, at an astounding young age, she successfully led multiple missionaries to the Pacific Northwest Territories of the United States. In 1857 the Sisters settled in Vancouver, Washington to create an institution to support orphaned girls and boys. The establishment also housed the elderly and insane. This little charitable institution would eventually become the first St. Joseph Hospital. Two years later, Mother Joseph formed the "Sisters of Charity of the House of Providence in the Territory of Washington." To this day, it is one of the oldest organizations in the region. Mother Joseph helped bring numerous charitable institutions to the American Northwest including eleven hospitals, five schools for Native American children, and two orphanages for children from all backgrounds. The model for bronze man pushing the wheelbarrow was not alive during Mother Joseph's time, but is also famous across the Northwest in his own right. The figure toiling away is Harold Balazs, the artist behind some of Spokane's most remarkable works including the Rotary Riverfront Fountain, the Lantern Statue and the Centennial Sculpture. Spiering and his good friend collaborated on this project, Spiering the artist, while Balazs is the unexpected model. Lacey Sipos , “The Call and The Challenge,” Spokane Historical, accessed April 20, 2019, https://spokanehistorical.org/items/show/191. Arts Department. "Sculpture Walk." City of Spokane Arts Department. 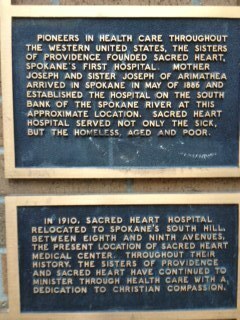 Accessed April 23, 2012.http://www.spokanearts.org/highlights.aspx PeaceHealth Southwest Medical Center.Accessed April 23, 2012. www.swmedicalcenter.org/wheresmotherjoseph Providence. "Caring for Washington Since 1856." June 27, 1991. Accessed April 21, 2012. http://washington.providence.org/about/history/. 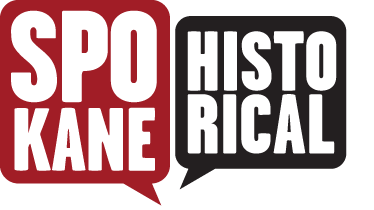 HistoryLink. "Mother Joseph of the Sisters of Providence (Esther Pariseau) (1823-1902)." Accessed March 21, 2012. http://www.historylink.org/index.cfm?DisplayPage=output.cfm&File_Id=5483.